At the recently concluded 22nd edition of the World Petroleum Congress in Istanbul, Turkey, IndianOil bagged the WPC Excellence Award for its innovative and ground-breaking INDMAX technology. 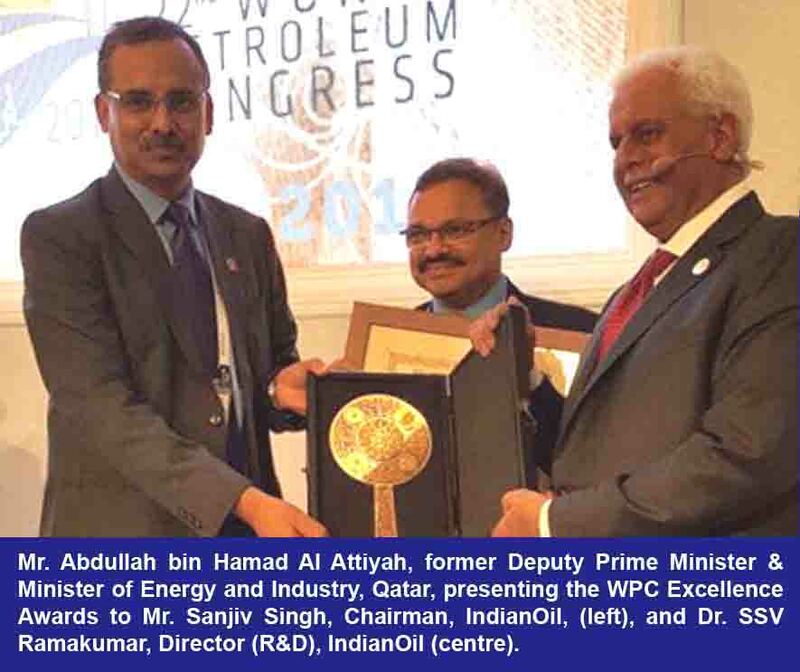 The Award was presented to Mr. Sanjiv Singh, Chairman, IndianOil, and Dr. SSV Ramakumar, Director (R&D), by Mr. Abdullah bin Hamad Al Attiyah, former Deputy Prime Minister & Minister of Energy and Industry, Qatar. Developed by IndianOil’s R&D Centre, the INDMAX technology is highly suitable for heavy crude oil feeds contaminated with metals. IndianOil had set up an INDMAX pilot plant of 0.1 million metric tonnes per annum (MMTPA) capacity at its Guwahati Refinery in 2003. Thereafter, a full-size (4.17 MMTPA) unit was incorporated at its state-of-the-art Paradip Refinery commissioned in March 2016. The INDMAX technology (a type of fluidised catalytic cracking, or FCC, technology) is designed to produce 44% LPG, the highest yield from such units. The commissioning of the commercial-scale INDMAX unit at Paradip marked a major milestone for Indian refining and catapulted IndianOil into the league of world-class technology licensors. Riding on the success at Paradip, the IndianOil Board has approved the setting up of an INDMAX unit (including LPG treatment) of 0.740 MMTPA capacity at its Bongaigaon Refinery. It is scheduled to be commissioned in 2019. In addition to the WPC Excellence Award for INDMAX technology, IndianOil also won the top honours for the unsurpassed scale of implementation of Pradhan Mantri Ujjwala Yojana (PMUY) it had spearheaded for distribution of deposit-free LPG connections to below-poverty-line families. Next Next post: iBall launches 10 LED Power Bank in an exclusive design!